Seam failure. Over time, single-ply membranes can shrink, become brittle, and lose elasticity. As a result, stress increases on the membrane’s seams, resulting in failure. Seam failure also can result from improper installation techniques that lead to seam voids or bad welds. Attachment failure. 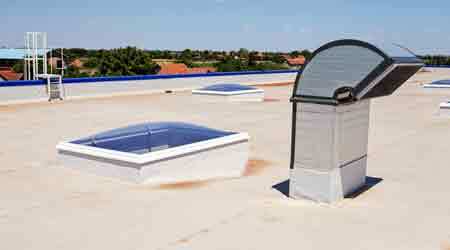 All types of single-ply roofing are subject to damage from wind uplift. If the uplift is severe enough or if the membrane attachment method is deficient, a strong wind can tear off portions of the membrane. While the wind is the mechanism for this problem, the cause can include delamination of the roof’s core due to improper application, adhesive failure, or water penetration. Depending on the size of the affected area, workers can reattach the membrane using plates and screws, or it might require removal and installation of a new section of membrane. Blisters. Blisters are a localized loss of adhesion of the roof membrane from the underlying roofing material. They are most often result from moisture trapped beneath the roof surface. Small blisters usually can be left alone and monitored. Larger or expanding blisters generally indicate the presence of additional moisture below the membrane, causing further damage. Shrinkage. As the membrane material ages and loses elasticity, it shrinks and places stress on flashings, resulting in tears to the membrane or flashing that has pulled away. Membrane cracks often accompany shrinkage.